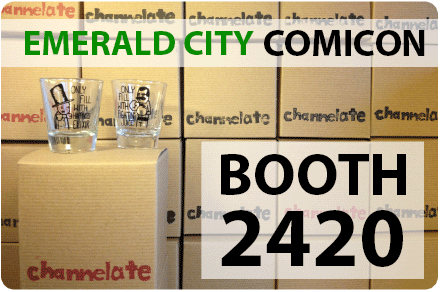 Next weekend I will be at The Emerald City Comicon in Seattle! I’ll be there with all three books, the rest of the Bear Shirts, prints, and both shot glass designs. I’ll also have some original artwork with me. Come by and at the very least say hi! Channelate will be sharing booth space with the likes of Invisible Bread, Buttersafe, Robbie and Bobby, ARG, Corvink, and Woody After Hours. It’s like a webcomic island! So remember 2420 when you’re aimlessly stumbling about the convention center. Here are the lots of sharing option after the use it you can ask to your friends just use for your computer system. Just open this easy topic and make the good combination.